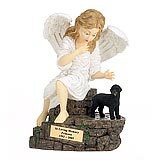 "I received my Angel on Friday and she is "everything" I new she would be - absolutely the most darling urn ever. She was well worth the wait of almost a yea and am thankful Tasha has the most beautiful resting place ever until we are together again. Of course she has already been shown off to some of my friends who were astonished and wondered where in the world I had found her. I directed them to your website naturally. Thanks again - we are now at peace. " 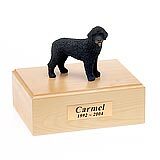 All available Portuguese Water Dog dog urns and memorials will be displayed with the figurine on the Portuguese Water Dog urn you select and in the appropriate size.